Fall is a great time to plant trees and shrubs, when roots can get established before winter’s cold weather. 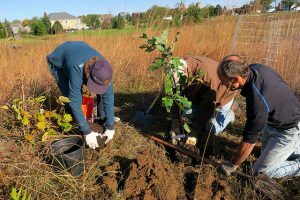 Native trees and shrubs provide the best choices of woody plants because they absorb storm water, can survive our extreme temperatures, don't need fertilizer or insecticides and need watering only during the first year or two to get established. Online ordering for the fall plant sale will begin in August, but you can start planning now. We have created permanent web pages of local native plants organized by categories: Ferns, Forbs, Grasses and Sedges, Shrubs and Trees. You can filter by sun requirements, water requirements and color. Bookmark our native plant pages so you can find them when you need them.